For the 2019-2020 school year, the federal government’s financial aid form, the FAFSA, can be filed as early as October 1, 2018. It relies on current asset information and two-year-old income information from your 2017 tax return, which means you’ll have the income data you need when you sit down to complete the form. This is a relatively new process. A few years ago, parents had to wait until after January 1 to file the FAFSA and use tax data for the year that had just ended, which forced them to scramble to complete their tax return in order to complete the FAFSA. If you have a new or returning college student, it’s a good idea to file the FAFSA as early as possible in the fall because some aid programs operate on a first-come, first-served basis. The deadline for filing the FAFSA is typically March or April and will vary by college. But don’t wait until then. It’s a good idea to submit any college aid forms as early as possible, too. The FAFSA is a prerequisite for federal student loans, grants, and work-study. 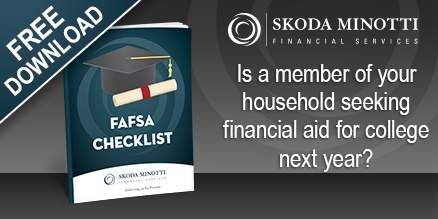 In addition, colleges typically require the FAFSA before distributing their own need-based aid and, in some cases, merit-based aid. Even in cases when you don’t expect your child to qualify for need-based aid, there may be another reason to submit the FAFSA. All students attending college at least half-time are eligible for federal unsubsidized Direct Loans regardless of financial need. (“Unsubsidized” means the borrower, rather than the government, pays the interest that accrues during school, the grace period after graduation, and any deferment periods.) So if you want your child to have some “skin in the game” with a small loan, you’ll need to file the FAFSA. (Loan amounts are capped each year: $5,500 freshman year, $6,500 sophomore year, and $7,500 junior and senior years.) What if you file the FAFSA but then change your mind about taking out a loan? Don’t worry, you aren’t locked in. Your child can always decline the loan after it’s offered. The FAFSA is available online at fafsa.ed.gov. In order to file it, you’ll need to create an FSA ID if you haven’t done so already (follow the online instructions). You’ll need to resubmit the FAFSA each year, but fortunately you can use the built-in IRS Data Retrieval Tool to have your tax data electronically imported, which saves time and minimizes errors. Do you have questions about financial aid or college planning? Please contact Lou Trivisonno at 440-449-6800 or ltrivisonno@skodaminotti.com. This entry was posted in Financial Services and tagged college, college aid, college students, deadline, FAFSA, financial aid, financial services, forms, grants, student loans. Bookmark the permalink. Follow any comments here with the RSS feed for this post. Comments are closed, but you can leave a trackback: Trackback URL.